Proving that Islam is peace. Proving that Islam is Peace. Moslem persecution of Christians reaches Nero-Diocletian levels. But the 'civilized world' yawns. Germany issues state propaganda that Mohammed was a Feminist as millions of young Moslem males invade the Eutopia, with half of all EU rapes carried out by Moslem men already a plague. US voters elect a Moslem Marxist twice as President and feel themselves enlightened. The UN and other cultural Marxist transnational orgs are too obsessed with plant food causing climate, Islamophobia, or transgendered equality to give persecuted Christians even a passing sneer. “..More than 100 million Christians are being persecuted globally, according to the 2016 Open Doors World Watch List, and more than 80 percent of that persecution is down to religious fundamentalism of some kind. A Christian is killed by a Moslem every five minutes. The witless worms in the MSM and political elite are abettors of murder. They do nothing while Christians are slaughtered, raped and slave traded. No hell or pit of Gehenna is deep enough for these immoral morons. Jihadic fascism embraced by the chattering cultural Marxist classes. 1400 years of Jihad, the murder of Christians, the abolition of Christian society, the enslavement of Christian men and women – some 10 million – and the evisceration of Christian churches and symbols. Mosul Iraq, once had 35.000 Christians, now there are none. Yet the weight of some 1400 years of Jihadic history, did not prevent the morons in the MSM, and the chattering political class, to screech like 5 year olds about the 2011 'Arab Spring', which very quickly proved itself to be nothing less than a manifestation – yet again – of Moslem Fascism and terror. Imagine if the Catholic Catechism stated that all non Catholics must be 'killed, humiliated, executed or crucified' Sura 5:33. The MSM and the elite would advocate for the elmination of the entire Church based on 'hate speech laws'. But not so with the Meccan moon cult fascism. All is rose petals, civilization and the invention of fire with the Moslems. The overt supremacism and cult intolerance of Islam is breathtaking. Yet most of the world ignores it, preferring to believe pace the Atheists, that all 'religions' are bad [Islam is not a religion]; or that Christians and Jews deserved to be murdered by Moslems for 'crimes' past and present – the cultural Marxist relativity principle. These are arguments from ignorance, cowardice and a deep stupidity. They are not enlightened, progressive or any of the other rhetorical dogma of the post modern world. They are justifications for the slaughter of innocents and are mouthed by brutes who abet and extend the crimes of Islam. Islam hates the Jew and Christian. It will not stop until both groups are eradicated. Islam hates. It does not love. Islam kills. It does not protect. Islam destroys. It does not, and never has created. Link to a YouTube on What Moslems do not want you to know about Mein Koran. 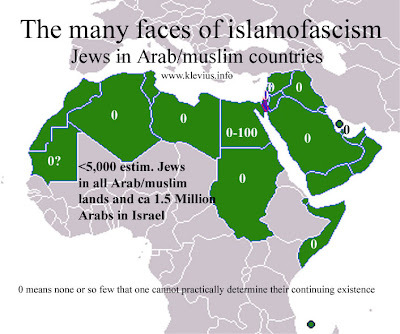 Jews and Christians are being effaced across the Middle East, where Judaism and Christianity were dominant and civilization was built from Syria to Spain on Judaic-Christian ideals, virtues, efforts and intelligence. Who again are the Fascists ? 2/20/2015: Islam hates the Jew and Christian. It will not stop until both groups are eradicated. 9/22/2013: Christian hate in the Koran. Jihad all the time. 9/16/2013: 25% of the Koran is hate speech against Christianity and Christians. 7/12/2013: Christianophobia – Islam's hatred of Christians, Sura 61 - the madness of it all. 5/9/2013: Christianophobia – Islam's hatred of Christians, Sura 38 'Saad' or just 'Sad'? 3/1/2013: Christianophobia – Islam's hatred of Christians, Sura 20 or 'Ta Ha' not to be confused with Tee-hee. 2/4/2013: Christianophobia – Islam's hatred of Christians, Sura 12 - Joseph was really a Moslem! 2/1/2013: Gatestone: November 2012 Moslem inspired Christianophobia - feeling the love. 1/10/2013: Christianophobia – Islam's hatred of Christians, Sura 6 - Hub'Al or Allah is uber alles. 1/6/2013: Christianophobia – Islam's hatred of Christians: Sura 5 - Kill execute and crucify the Christians.